In case none of our boots fit your leg measurements, we can custom make you a pair. 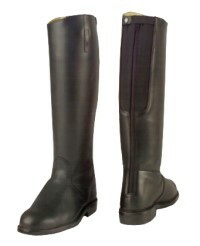 The boots can be made wider or narrower, longer or shorter to your own measurement. Utilise the Size Checker below to establish your requirements. Made out of the finest calf leather this boot ensures maximum comfort with a classic modern style. Once you have established all your measurements you are ready to order.Please note that custom made boots cannot be returned or exchanged. Please put all the leg measurements in the Special Instructrion box at Checkout.